Eatza Pizza franchise business opportunity. Free Eatza Pizza business franchise information. 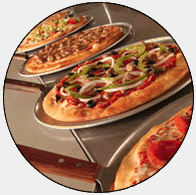 Eatza Pizza is the fun, value-oriented family pizza restaurant franchise where friendly service, reasonable prices and great food are the star attractions. No gimmicks, just great food with a good selection. When the first Eatza Pizza was founded in <?xml:namespace prefix = st1 ns = "urn:schemas-microsoft-com:office:smarttags" />Phoenix, Arizona in 1997, these were, and still are, our core values. That's still the foundation of Eatza Pizza today. If you are a good communicator, a pizza lover, and commercially minded with market leader ambition, this could be the ideal business for you! 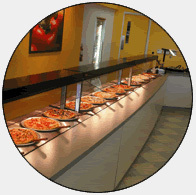 As an Eatza Pizza franchisee, you can offer your customers at least 18 fresh pizzas every day. It's all you can eat for one low price. All you can eat pizza, pasta, salad and dessert. With customer brand awareness growing steadily, our Eatza Pizza franchise is an excellent business opportunity for anyone with the ambition and determination to run their own business and succeed within the food industry. Do things your way for a change! To become part of our success, follow the example of fellow Eatza Pizza franchisees who have established themselves in 23 locations in Arizona, Utah, Washington and Ohio. More Eatza Pizza restaurants are under construction or in development in Arizona, Utah, Ohio, Oregon, Idaho, Nevada, Washington, Michigan and California. Using our tried and tested business model combined with your skills and ambition - not to mention 18 different pizza styles every day - and there's 18 good reasons alone why Eatza Pizza franchise ownership can be a tremendously rewarding and lucrative experience. Do you enjoy the rewards of hard work? Can you motivate and train others? Do you love mozzarella, revere pepperoni, cherish a golden crust? If you answered yes to all of the above, we have one word to say to you: congratulations! It's most likely that you have what it takes to be a successful Eatza Pizza franchise owner. To learn more about the Eatza Pizza food franchise opportunity, simply complete the form below.